As a recipient of a $100K for 100 grant from Cummings Foundation, Project Place has benefited not only from substantial financial resources but also from the publicity and enhanced standing that comes with Cummings Foundation’s support. This grant for $100,000 confirms for potential donors and volunteers that we are making a positive impact in the local community. 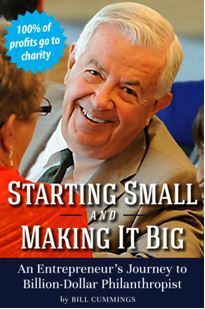 Knowing that all proceeds from Bill Cummings’ new memoir, “Starting Small and Making It Big,” go to Cummings Foundation, we could not be more proud to recommend this book. By purchasing “Starting Small,” for yourself or as a gift, you are actually giving back in a charitable way — and you will likely be inspired by what you read. We are pleased to share a book review below. More information about Starting Small is available online.